“What CSC needs to do now is control distribution channels,” says CSC Chairman Wong Chao-tung as he outlines the key changes in the company’s business strategy over the past decade. In 2016, CSC emerged as one of the best-performing steelmakers in Asia precisely because it had a firm grip on distribution channels. As global iron ore fines prices finally recovered last year, 2016 was in principle not a bad year for the steel industry. But as China continued to glut the global market with cheap exports to reduce its vast stockpiles, Asian steelmakers found it hard to compete. Japan’s largest steel producer, Nippon Steel & Sumitomo Metal Corporation, saw its revenue and profits continue to decline. South Korean steelmaker POSCO fared somewhat better as profits returned to positive territory. Revenue, however, kept shrinking. In comparison, CSC put on a stellar performance, with an annual revenue growth of 2.8 percent and massive profit growth of 110.9 percent in 2016. This came on the heels of a lackluster 2015 that was shrouded by both shrinking revenue and profits. Moreover, CSC far outperformed its Asian rivals with a net profit margin of 6.6 percent compared to an average of 1.7 percent for Asia’s top-five steel producers. In the past, the CSC board, which holds its meetings in a conference room on the 29th floor of the China Steel Group headquarters in Kaohsiung, only cared about how much steel it could sell to downstream manufacturers. These days, the company has begun to approach end user brands in a bid to create demand on the buyer side. “Before, we had a demand-supply relationship with China Steel that did not go beyond trading steel materials,” says Chi-Bin Lin, chairman of the Engley Group, a Taiwanese-invested auto parts maker headquartered in northeastern China’s Changchun, as he recalls the early days of cooperation. “Now China Steel is willing to take the lead and jump into the fray together with us; that was inconceivable in the past,” he adds. In recent years, CSC has invested in mid-stream and downstream manufacturers, approached consumer brands, and pursued a strategy of high-end and light-weight steel production. This strategic reorientation is the main reason why CSC has managed to set itself apart from its Asian competitors. Wong notes that CSC began to try out new business strategies around 2007. Aside from approaching the customers of its own customers, the company also invested in promising downstream enterprises. This approach proved most successful when CSC managed to join the supply chain of Californian luxury e-car startup Tesla. Back in July of 2007, Tesla was just a young startup company, hoping to develop its own independent technology. CSC partnered with Tesla to develop customized electromagnetic steel sheets, and then went on to enlist the help of Taichung-based Fukuta Electric & Machinery Co. Ltd. to make motors for Tesla with its special steel. “We call this ‘pre-sales services’. I communicated directly with Tesla, [telling them] I will develop what you need, and when I have developed the product, I will go to Fukuta and have them make motors under contract,” explains Wong in recounting how he won Tesla as a customer. Thanks to this cooperation, Tesla was able to release its first high-performance electric car, the Tesla Roadster, in 2008. Subsequently, Tesla entered into a partnership with CSC and Fukuta. At the same time, CSC became Tesla’s only supplier of electromagnetic steel sheets. Aside from Tesla, CSC has also used its “pre-sales services” to squeeze into the automobile supply chain in China. When the Engley Group found out that some of their biggest competitors, such as Gestamp from Spain, Magna Cosma from Canada and Benteler from Germany, were setting up hot stamping plants for ultra-high strength steels in China, Engley Chairman Lin went to CSC for help. As a result, the two companies decided to partner for joint ventures, jointly establishing Honley Auto Parts Co. Ltd. in Taiwan and CECK Auto Parts Co. Ltd. in Changchun, China. 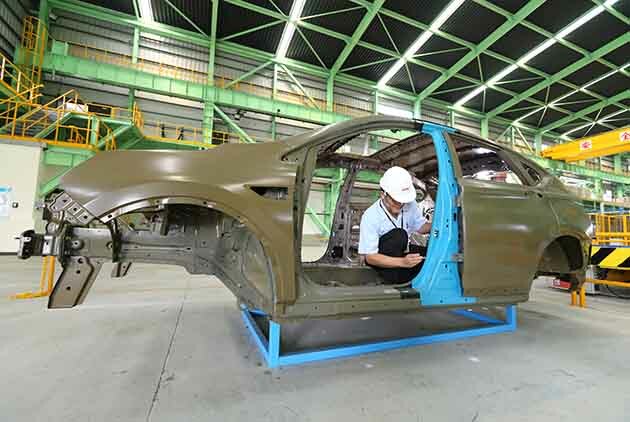 The joint ventures use CSC’s hot press forming technology to manufacture light, slim and strong auto parts, successfully becoming suppliers to Chinese automobile makers. At the same time, they expanded sales channels for ultra-hard steels from CSC. “Engley would do our part, acting as an observer, being on top of design trends in the car market early on and expanding possibilities for future cooperation with CSC,” says Lin. Given the steelmaker’s transformation, Lin is quite optimistic about the cooperation. CSC successfully established new distribution channels for its light-weight and ultra-hard steels by directly working with end user brands to better understand their needs as well as investing in promising downstream manufacturers. As a result, the company does not have to compete with its Chinese rivals on price. In 2016, CSC produced 11.13 million tons of steel products, including 6.338 million tons, or 56 percent, of high-end steel products. “Now the steel industry needs to join hands with mid-stream and downstream customers to find new bright spots, or else you can’t survive,” says Wong. “The fact that I have developed something now does not mean no one is chasing me from behind,” Wong says, adding that CSC is not just investing NT$15 billion in the construction of a silicon steel sheet production line in Taiwan, it is also, since the beginning of this year, committing more than one percent of its revenue to R&D. “Although we already have more than 300 of our staff working in R&D, this is still not enough,” says Wong. To strengthen the R&D department, CSC is collaborating with R&D talent from National Cheng Kung University (NCKU) in Tainan, Academia Sinica in Taipei and the National Chung Shan Institute of Science and Technology in Taoyuan. In terms of academia-industry collaboration, CSC has signed five-year cooperation plans with Taiwan’s leading universities, including National Taiwan University, National Tsing Hua University, NCKU, National Sun Yat-sen University, National Chung Cheng University, National Chung Hsing University, National Taiwan University of Science and Technology and Kaohsiung University of Applied Sciences, as part of the Ministry of Science and Technology’s “Academia-Industry Alliance” project. On top of that, the company has established engineering R&D centers at NTU and NCKU. “The topics for CSC’s academia-industry collaboration were designed in a very down-to-earth manner. For every topic, it was considered quite comprehensively how it could be seamlessly linked to CSC technology,” explains Hwang Wen-shing, professor at the Department of Materials Science and Engineering of NCKU. At the same time, CSC has set up a joint laboratory with the Hua-chuang Automobile Information Technical Center Co. Ltd. (HAITEC) for auto parts, and another lab for motors with inverter and compressor maker Rechi Precision Co. Ltd. It was clear that CSC’s transformation would not happen overnight. As a state-run enterprise, CSC refrained from making major adjustments to its business strategy during governmental changes for the sake of consistency. “Each year, the board of directors draws up a five-year plan regarding business operations, the international situation, the industry outlook and future business opportunities, which is reviewed and amended year by year,” says Wong. He believes that the consistency of CSC’s operational strategy is owed to this approach. Aside from guaranteeing strategic consistency, this approach has also helped CSC keep its transformation drive on track. Successful product diversification in the international market, the cultivation of new sales channels, and a focus on high quality are the reasons why CSC outperformed its rivals this year.